Happy Underwear Day! Last year National Underwear Day was held on August 5th, so today is not the official day. However, it is Dav (pronounced Dave) Pilkey, that has brought us Captain Underpants . So, just for kicks, let's greet our kids or students today with a little undergarment humor. It is silliness that sets Pilkey apart from every other author. From his silly nickname, Dav, that stuck after a mistake on his Pizza Hut name tag (pilkey.com) to the inclusion of his pets into books like Dogzilla and Kat Kong, he is always infusing humor into his books. This is an author who loves to have fun and thrives at being silly for a living. Dav Pilkey has publicized that it was his struggles in school that ultimately led him to the successful career that he has today. Back in elementary school, he was a boy that often got in trouble and nowadays would have been labeled as a child with attention deficits. The punishment for his shenanigans in classroom was to be sent to the hallway. It was in the hallway where his career began. Captain Underpants was actually invented in second grade during those long stints at his hallway desk. The fact is that Dav Pilkey didn't mind going in the hallway because he always stocked the desk with lots of supplies and his friends all loved the comics he brought back to the classroom. His teacher often tried to humiliate him into correcting his behavior by tearing up his books and telling him he can't make silly books for the rest of his life. Things at school really don't change for Dav until college when a professor at Kent State University encouraged him to write. It wasn't too long after that encouragement that Dav won a writing contest and got his first book published, World War Won at the age of 19. Honestly, it is best that you hear him tell the story of his experiences with teachers by viewing a speech from the International Reading Association Conference. It is a hoot! 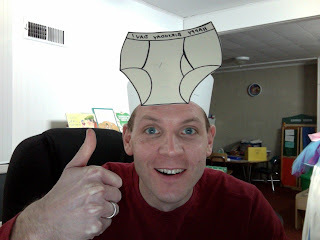 I have a funny story about celebrating Dav Pilkey in my classroom. I decided he was the perfect author to celebrate with my fourth grade students. I had a group of 9 boys in a special education class and most of them had reading and behavior difficulties. I thought the boys would get a kick out of their teacher reading Captain Underpants and the Perilous Plot of Professor Poopypants . I started the book at the beginning of the week and they loved it, but I overlooked the fact that I was going to be out at the end of the week to present at a conference. I wrote up lesson plans for a substitute and thought about postponing the reading of the book until I got back. However, I thought it would be great to have a young substitute teacher sit down at my desk and realize that she would be saying "poopypants" multiple times to a bunch boys. She didn't leave me any unhappy notes, and the boys said she read the book. I wish I could have been there! We read quite a few Dav Pilkey books this week with my children. My biggest surprise was the reading of Ricky Ricotta's Mighty Robot to my 2 year old son. I actually asked my 4 year old daughter to listen too, but she was too cool at the time. I did catch her looking over quite a few times as I was reading. The reason I was surprised by this book was because my son sat through the story from beginning to end. The book has 14 chapters, but it is filled with comic-like illustrations and the pages have very few words. It was his first chapter book! Many teachers credit Dav Pilkey to inspiring young unmotivated boy readers. The books just ooze everything "boy" as you read them. The last book I would like to mention is The Paperboy . Strangely, it is not a silly book and it won serious recognition through the Caldecott Honor Book award. The book is about a paperboy and his experience waking up early in the morning. Pilkey was actually a paperboy when he was younger and this book recalls that experience. I found this story at Dav's website. I would encourage you to go to the website and check out the "Dav's Books" section. For each of the books there are "Special Notes" that include Dav's thoughts on the book. The notes give the story behind the story. I encourage you not to be a "Dumb Bunny " and celebrate Dav Pilkey's birthday this week. Maybe make a funny hat! I wanted to wear the hat to take my daughter to school, but she said it wouldn't be a good idea. 2. All of Dav's Books with commentary from him and activities! 3. Scholastic Captain Underpants Website - Look for the Ricky Ricotta Tab too. 4. Great Lesson Plan ideas - May take some time to load. What a great blog! I just read this to my son and he loved the title "Captain Underpants and the Perilous Plot of Professor Poopypants"! He gets a little bored sometimes with longer books or chapter books. I was thinking this might be a great author he would enjoy listening to me read. Could anyone recommend some of your favorites that my 4 year old might like? Thank you for leaving a comment. Captain Underpants is great as long as you don't mind the potty humor. Pilkey also has the Ricky Ricotta and the Mighty Robot Series. There is another series too, that I haven't read called Super Diaper Baby. I just posted on another blog my top 3 picture books for young boys. I started with I Stink by Kate McMullan, Robot Zot by Jon Scieszka, and Trashy Town by Andrea Zimmerman. I really enjoyed the speech by Dav. Isn't it interesting that there were no "labels" for kids,back in the day? Maybe we should go back to not labeling kids. I loved the speech too. I am just happy that a teacher finally did recognize his talents and gave him the encouragement he needed to get started writing. I feel that is the take away from this story - whether a label, no label - children have strengths and we need to motivate them to explore their potential. Thanks for becoming a follower of our Boys Rul3! Boys Read! blog. If you know any 9-14 year-old boys, encourage them to write to us. A lot of boys love Dav Pilkey, of course, and one wants me to link to his games from our blog. I agree with you on The Paperboy. Thanks for visiting Carl. Your blog is awesome for young boys - my son is only 2 but definitely is going to love the content you display on your blog.